Most guests will look forward to enjoying that delicious sweet last course of wedding cake at your reception. 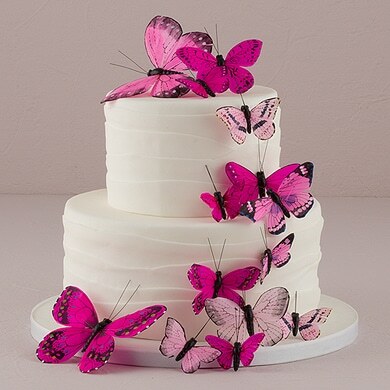 Wedding cakes are works of art, created with finesse and customized with unique details of unparalleled beauty. Most wedding cakes today are not only a treat for the taste buds, but are a sensationally striking too. However, these masterpieces of sweet indulgence take time, effort and resources to create. It is no wonder that they are pricey and take up a chunk of your wedding budget. Fortunately, there are creative ways to have your dream wedding cake without breaking the bank. This is what we will look at today. Read on to find out ten different ways to slice your wedding cake budget, and still get what you want. 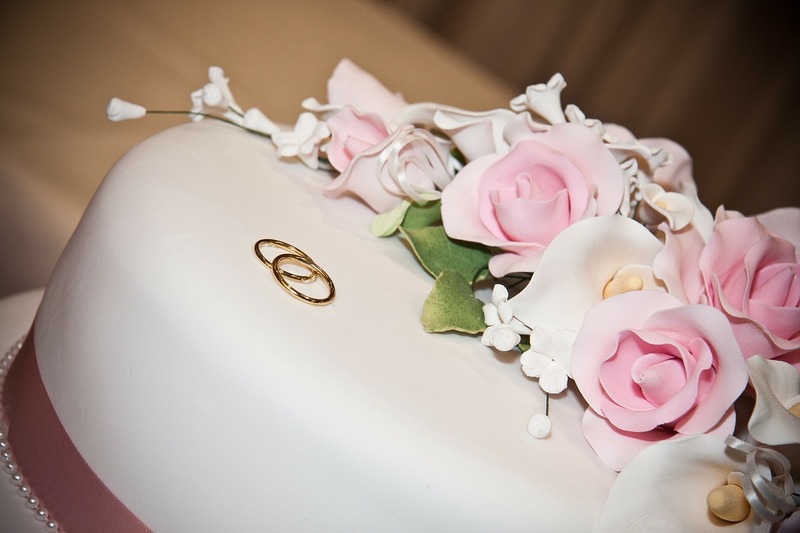 It is the time and effort that goes into creating your wedding cake, that translates into a higher cost. Agreed that hand-crafted details look fabulous, but they will cost you accordingly. 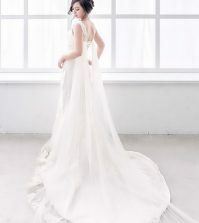 Fine lace-like details and intricate motifs will cost more than plain designs or those that are easy to do. Almost every design that you want on your cake will have an equally appealing alternative that costs less. Just make sure you ask your baker and find out. For example, instead of individual sugar flowers that have to be made one-at-a-time, and perfected to the last detail, you can choose flat flowers of a single solid color. This saves your baker several hours of time, and you will get it at a much lesser price. Similarly, consider stencil prints or monograms instead of hand-piped details. Accessories like satin ribbons in a chosen color can instantly dress up a cake, and are easy on the pocket. Choose real flowers: Check with your florist for seasonal flowers that are non-poisonous and can be used on your wedding cake. It will cost less, and it will look splendid. 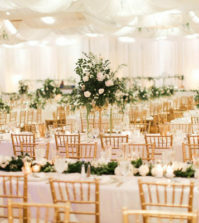 All it takes is a little planning and organizing to get the flowers on time and set them up right. Choose flat flowers or painted flowers for a similar effect: Flat flower designs without many layers, or those that are painted on to the cake cost far less than sugar flowers. 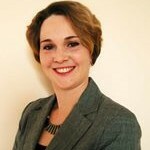 So, this may be the way to go, to help your budget. Choose simple designs: If you still want sugar flowers without the outrageous price, choose simple designs like lilies that are easier to make, than roses or orchids. Keep it to a minimum: To avoid the hefty price tag for decorating your entire cake with it, choose a design with a cluster of flowers on just one tier instead. You could restrict the flowers to just the top tier or use it as a stem along the side of the cake, and decorate the rest with other inexpensive accessories. 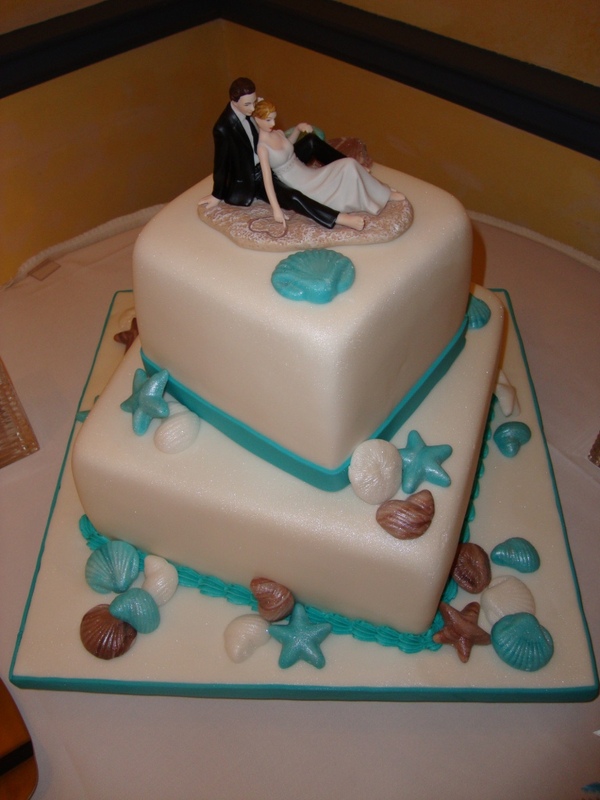 Fondant cakes are a delight, with their clear and remarkably soft texture, but they can be expensive. Fondant is considered the best cake decoration material for creative designs like ruffles and little figurines, with the added advantage that it has a marshmallow taste that almost everyone enjoys. If you choose a complicated design, or want the cake to look smooth and polished with a glazing finish, your baker may ask you to go with fondant. Although fondant gives the cake a refined finish, and it is easier to work with for precise measurements and details, it can cost several times that of butter-cream. This is why—to create a fondant covering for your cake, your baker has to first slather layers of butter-cream on the cake surface. It is to this that the fondant adheres. So, this means that you will be paying for both the butter-cream layer and the fondant topping. Another factor is that fondant, whether made by the baker himself, or bought, is always costlier than butter-cream icing. The soft butter-cream is usually made from scratch, and is easier to do, and so the lesser price attached to it. Don’t think that you will lose out on taste or look by choosing it. It has been the traditional choice that has never disappointed. 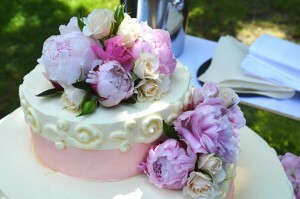 It can also be done in different colors, and a skilled cake-maker can design it to look as attractive as a fondant cake. Another budget-friendly option is to go with the current trend of naked cakes. Here, the cake layers are not frosted, and it is sparingly decorated with cream, fruits and berries for a natural, refreshing look. If you always wanted a big cake, you can have it without paying for all those extra tiers. After deciding how many tiers are actually needed to serve your guests, you can ask your baker to do some extra tiers that aren’t made of real cake. It will still be iced and decorated to match the design you have chosen for your cake, and nobody will notice the difference. As long as all your guests get a slice, who cares whether the rest of the tiers are real or not. Let it be your own little secret! The other option is to choose a spectacular, but smaller display cake with one, two or three layers that look great. Couture cakes done on small scale are fantastic, and can look sophisticated and stylish. Keep this for the display at your reception. 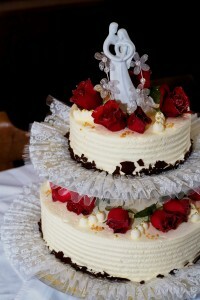 For the actual cake service, order kitchen cakes that will not be decorated, but will taste exactly like the original. This will be cut and served to the guests. This way, you will have to spend less, but your guests will still get a fantastic dessert. This article on the Bridal Guide website suggests that you can save up to fifty per cent by going this way, than choosing a big cake. Have you ever noticed how many of the guests leave a lot of cake behind on their plates, especially if there are other desserts too? Avoid wastage by asking your caterer to size the slices to three-fourth or half the original serving size, and serve it along with the other desserts. You can also have the cake slices placed in a buffet, instead of serving it at the table. This way, only those guests who actually want cake will take it. When you choose to do so, you can place the order for less than the actual head count, as it is pretty certain that not all your guests will want cake. The answer to this reader’s question on the cost of wedding cakes on the Knot suggests that for 300 guests, you can order just 150 slices of cake, and serve all your guests half-slices. Again, if your wedding reception is for 300 guests and you are serving cake in a buffet setting, you can place the order for just 250 guests and it will most likely be enough. The most budget-friendly cake shapes are square and round. 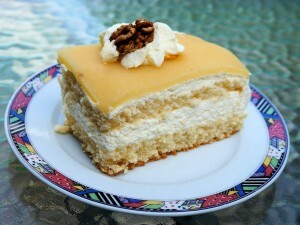 Square cakes are easy to section into equal portions without wastage. It is also comparatively easy to make. Most bakers can easily frost square cakes, just like they would with round cakes. So, that shouldn’t be a concern. 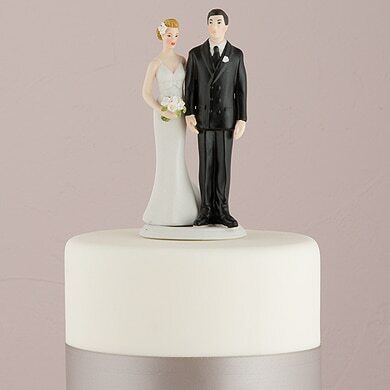 If you choose any unusual shape for one or more of your cake tiers, you will have to spend more on it. Topsy-turvy cakes are the most expensive of the lot, since it not only takes a lot of effort to create, but there is a lot of wastage in setting up the tiers. So, either go with the square or circular cake and decorate it to meet your vision. Use options like varying the heights of the various tiers to obtain an equally interesting effect. Cakes that are shaped like real-life objects, like cars or books can cost extra. The alternative is to make the cake in a standard shape, and have the picture of the object printed on it in edible ink. It may not look the same, but neither will it be as expensive. The other thing that can make a difference is the flavor. Standard flavors like vanilla and chocolate are loved by all, and cost much lesser than gourmet choices like carrot or cookies ‘n’ cream. Similarly, sponge cake is cheaper than fruit cake, but delicious. If you must have a premium flavor for your tiered cake, consider doing it for the smaller tiers and choosing standard fare for the larger tiers. You can also cut a few corners with the way you set up your dessert table. Have a dessert station set up and spread the different desserts out for maximum effect. By varying the size and height of each platter, it will look abundant and interesting. Also space the desserts to look as though there is more than you actually have. Many couples splurge on an attractive cake stand, but you can get creative with this as well. If the venue has wedding cake platters and stands, use them creatively. Dress up the table with an attractive table cloth, interesting food labels and an interesting backdrop or buntings, so the focus is not on the cake stand. You can also go with unusual choices like distressed and weathered wooden crates for relevant themes. Just let those creative juices flow, and you will find several ideas that won’t cost you too much. Don’t delay your cake choices till last-minute. Start your search early, and you will most likely be able to snag a bargain or make use of a discount. Check if you can get a better deal if you make a full payment, or if you place your booking early. 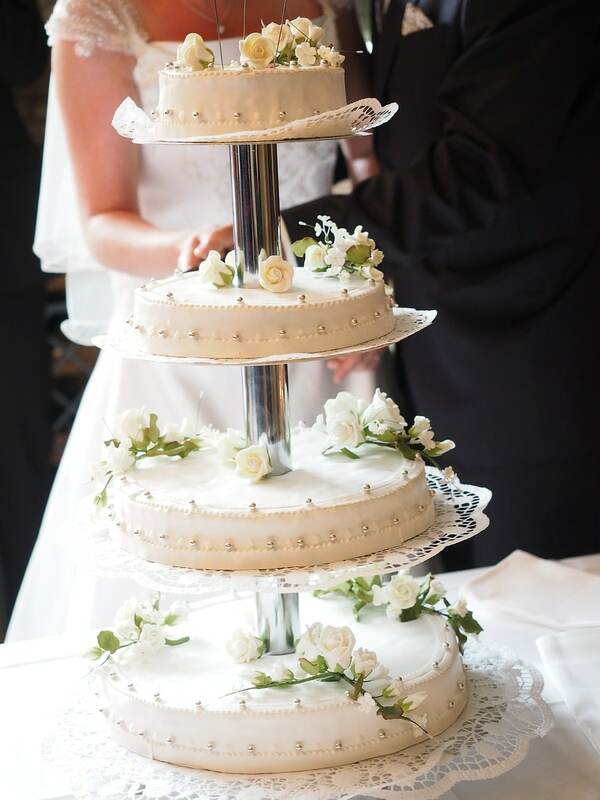 If your wedding day is after several months, booking your cake early may even allow you to lock the price at the current rate, before any price increase takes effect. It will also be one task off your list, so don’t delay. 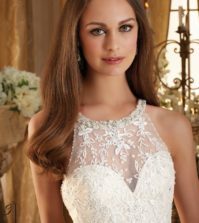 If there are any bridal shows in town, try to attend them and check out whether there are any cake makers offering attractive offers. Lastly, don’t forget to check if your venue or caterer offers a discount package on the cake, if you order it from them. Now that you know all about how to get the best from your wedding cake budget, all you need to do, is to get started. Check out our list of cake vendors and their fantastic designs on Best for bride for some valuable inspiration or to place your orders, by clicking on this link. I was at a wedding last summer that went with a few of the more popular pies that the family liked. I thought that was a good idea to cut costs and still offer something sweet. I never thought about the cost of the cake, but like you said, keeping the design a little more simple is going to save you some money. Thanks for the tips! Excellent tips as always, Thank you very much for these. I thought it would be as easy as taking my budget to the cake maker and just seeing what they can come up with based on my ideas. Will that work?